The Scotty T. rex on display. Measurements of Scotty’s legs, hips, and shoulder point to a T. rex of enormous size. Persons and his colleagues relied on an equation developed by other researchers to infer its body mass, using the circumference of the femur, or thigh bone, to glean the amount of weight the legs could reasonably support. In this case, Scotty’s femur suggested a weight of 19,555 pounds, which is nearly 10 tons. At 13 meters in length, Scotty may not have been the tallest or longest T. rex that ever lived—but it was certainly big in terms of mass. Analysis of the growth patterns in Scotty’s bones suggests the dinosaur died in its early 30s, making it the most elderly T. rex skeleton ever discovered. Extensive injuries were detected throughout the body, pointing to a particularly brutal life. Scotty had broken ribs, an infected jaw, and bite marks on its tail, the latter of which appeared to be inflicted by a rival T. rex, the new study suggests. 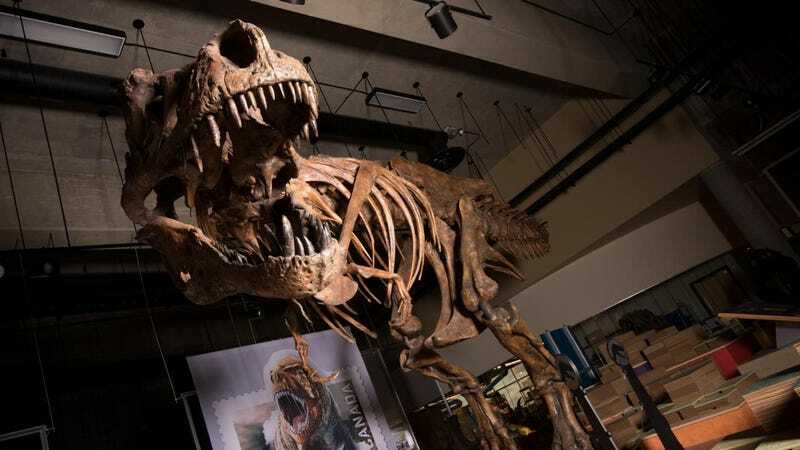 Persons and his colleagues compared Scotty’s skeleton to 11 other well-preserved T. rex skeletons, including Sue—a specimen otherwise known as FMNH PR 2081. Sue’s bones were found in 1990, and it was once considered the biggest T. rex skeleton, a title that now belongs to Scotty. Sue weighed in at 18,651 pounds (8,460 kg), which is around 5 percent lighter than Scotty. Indeed, other large theropod species, such as Spinosaurus aegyptiacus, Giganotosaurus carolinii, and Tyrannotitan chubutensis, may have been larger than T. rex, but more fossil evidence is needed for paleontologists to be sure. For now, T. rex remains king. As an interesting aside, paleontologists have noticed substantial size variations among the T. rex fossils. Some scientists have proposed a classification scheme based on two forms: “gracile” T. rexes with long and slender skeletons and “robust” T. rexes featuring stockier builds and greater bulk. Other paleontologists say these size discrepancies can be explained by individual variation or age. Another possibility is sexual dimorphism, in which females are larger than males. The reason for the hypothesized larger female T. rexes could have something to do with the increased physical demands of having to lay and protect eggs. A fascinating conclusion reached in the new study is that the sizes of T. rex and other dinosaurs are being understated by paleontologists. The reason, according to the authors, is that very few dinosaurs managed to survive into full maturity. Consequently, there are more fossils of younger, smaller dinosaurs than there are of bigger, older dinosaurs, resulting in a kind of selection bias. Looking at Scotty’s skeleton, with its wide-ranging display of injuries, life as a dinosaur was clearly tough—even when you’re a T. rex. John Hutchinson, professor of evolutionary biomechanics at the University of London’s Royal Veterinary College and an expert on T. rex physiology, was a bit blasé about the new study. “If you read between the lines in past studies and this new one, the Scotty specimen is not appreciably larger than other known specimens—at best, maybe 5 percent larger, and that is with a wide margin of error,” Hutchinson told Gizmodo. Paleontologist Thomas Carr from Carthage college, also not affiliated with the new study, said the absolute difference in size between Scotty, Sue, and others may not be great, but the Scotty specimen raises the ceiling for the maximum size of T. rex, which is now higher than previously thought. Correction: A previous version of this article incorrectly converted pounds to tons. We regret the error.